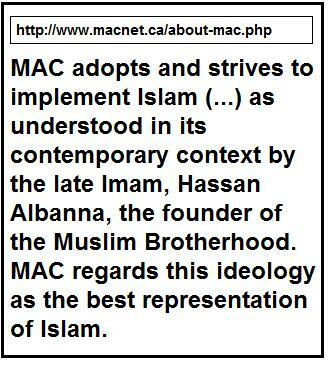 The Muslim Association of Canada (MAC) declares on its website (archived here and here ) that it aims at applying Islam “as understood in its contemporary context by the late Imam, Hassan AlBanna”. 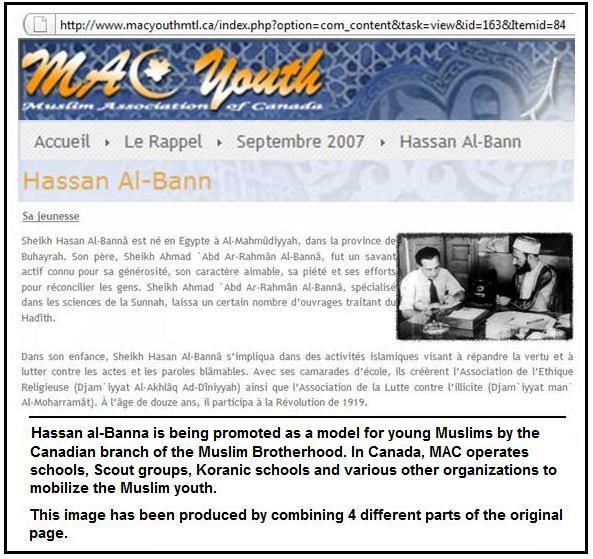 In order to clarify the dangerous implications of this profession of faith, Point de Bascule reproduces the 50-point Manifesto written in 1936 by the founder of the Muslim Brotherhood, Hassan al-Banna. His proposals of reform are very specific and touch all fields of human activity: political, judicial, administrative, social, educational and economic. 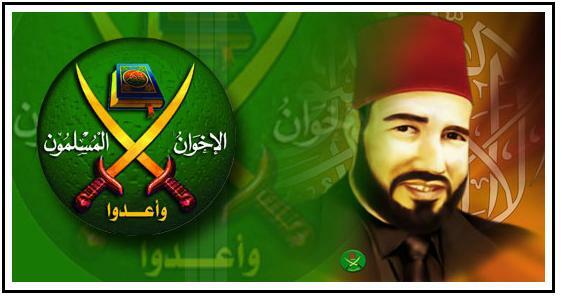 This document of the Muslim Brotherhood promotes an application of sharia that leads to a one-party State, the prohibition of dancing, the censorship of books and movies, the implementation of specific curricula for boys and girls and even a dress code for all citizens enforced by a religious police. The engagement of Al-Banna was that of a man who dedicated his entire life to controlling the life of his fellow citizens in the smallest details. After al-Banna’s death, the New York Times (February 13, 1949, p. 1) described his organization as a “political movement with mystic and fascist overtones” and its supporters as “fanatics”. How did al-Banna’s supporters manage to fool so many people in the last sixty years in order to be invited by so many world leaders, government authorities and Western universities to implement their agenda? By alerting to the Muslim Brotherhood’s objectives, Point de Bascule hopes to reinforce growing public resistance to the Brotherhood’s extended agenda, and the direct threat that this agenda represents for security and civil liberties. There are two available English translations of the Manifesto: one that is available on the Muslim Brotherhood website [Ikhwanweb.com] and on other Islamist websites and another one offered by Charles Wendell in his translation of Hassan al-Banna’s book Five Tracts [Berkeley, University of California Press, 1978, p. 126]. We have chosen to reproduce the second one. Besides a choice of words that varies from one translation to the other, which is understandable, there are other differences that are more substantial. In Wendell’s translation of Proposal 2 [Social sector], the women’s issue is described as “one of the most important social problems” while the Brotherhood’s version characterizes it as “the most important” one. The very first point of the Manifesto [Political sector] advocates a one-party State. Wendell’s translation adds that the Brotherhood aims at the “channeling of the political forces of the nation into a common front and a single phalanx”. This reference to the “phalanx” is nowhere to be found in the Brotherhood’s version. Since the Manifesto was written in the thirties while fascism was booming, it is revealing that Islamists have used fascist terminology in order to describe their own objectives. The term “phalanx” was frequently used at the time by fascists, notably by Spain’s fascists led by Franco to designate their own organization. It would be very unlikely that the translator Wendell had decided to add this reference to the phalanx on his own without having found it in the original text in Arabic first. On the other hand, it is easily conceivable that modern day Islamists may have preferred to abandon this fascist reference. Until now, we have not been able to access the original Arabic version of the Manifesto in order to compare it with both translations. In the second group of proposals dealing with the social and the educational sectors, the Muslim Brotherhood’s translation reads as follow: “Proposal 26: A consideration into the means of gradually forming a national uniform”. This proposal follows many others that are dealing with the education system promoted by al-Banna. At first glance, we could conclude that this proposal is limited to a dress code for students. However, Wendell’s translation of the same proposal gives us hints that the Muslim Brotherhood envisions a dress code not only for students but for everybody. “Proposal 26: Consideration of ways to arrive gradually at a uniform mode of dress for the nation”. Proposal 27 (as it can be found on the Brotherhood’s website) confirms that al-Banna was eager to search people’s wardrobes. It asks for “An end to the foreign spirit in our homes with regard to language, manners, dress, governesses, nurses, etc; All this should be corrected especially in upper class homes”.